Partly cloudy skies. Slight chance of a rain shower. High 68F. Winds NW at 10 to 20 mph..
Clear. Low 47F. Winds WNW at 5 to 10 mph. 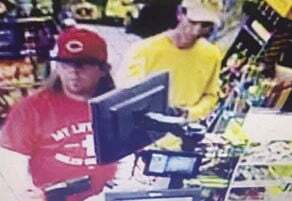 Livingston Parish sheriff's detectives are trying to identify these two men. Another customer at this convenience store left a debit card behind and they took it, according to a sheriff's spokewoman. Livingston Parish sheriff's detectives are trying to identify this man. Another customer at this convenience store left a debit card behind and he took it, according to a sheriff's spokewoman. 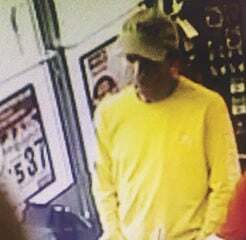 DENHAM SPRINGS – Livington Parish Sheriff’s Office detectives are trying to locate two men who took a debit card accidentally left behind by another person, according to a sheriff’s spokesman. Sheriff’ deputies responded to a report of a stolen debit card at a convenience store off La. 16 in Denham Springs, said Lori Steele, sheriff’s spokeswoman. The victim reported accidentally leaving the card in the store’s debit card machine after making a purchase, she said. When the victim returned to retrieve it - minutes later - it was gone. Deputies reviewed video surveillance footage and found one of two men taking the victim’s card out of the machine, placing it into his pocket and leaving. “Our detectives would like to ID these subjects, locate them and then, have a word, Steele said. Anyone with information is asked to call (225) 686-2241 ext. 1 or Greater Baton Rouge Crime Stoppers at (225) 344-STOP (7867).